A display of signature quilts made by the Lopez community beginning in the late-1800s. Port Stanley School, 2970 Port Stanley Rd. Karen Alexander & AQSG member Susan Underwood of Seattle at the restored Port Stanley one-room schoolhouse. Bring one Signature quilt if you like. We will have Show & Tell as long as time allows. This guided tour of the Lopez Island Historical Society will include a viewing of Lopez Island Signature quilts and some of the stories behind them. This class is on the History of Early 20th Century Quilt Designers Ruby McKim and Marie Webster. Bring a quilt or two from either designer and any ephemera you may have to share. Mary & Kate Edgar Collection of Early British, French & American 19th Century Quilts. Two fellow AQSG members from Michigan are coming to share some of their fabulous quilts! Come examine early 19th century quilts up close and learn the stories behind the collection. 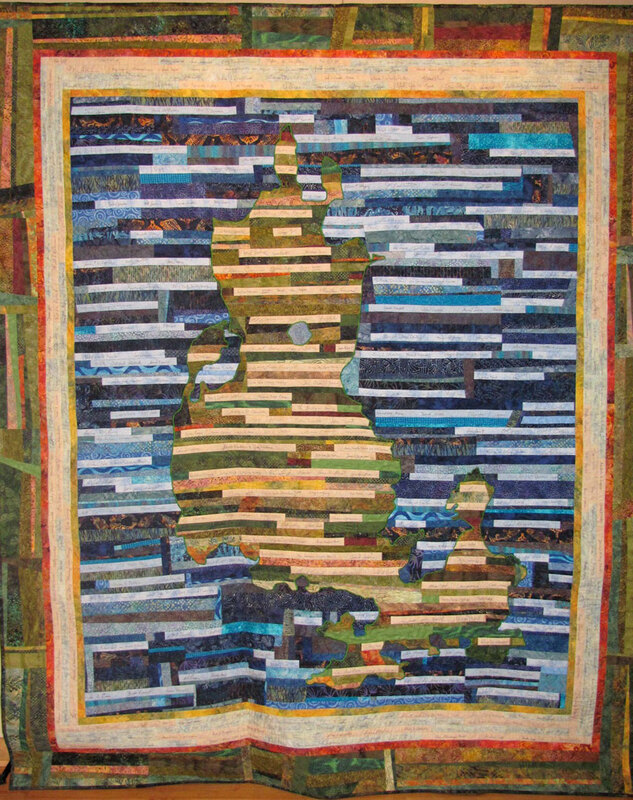 Karen Alexander will share a selection of quilts from her wide-ranging teaching collection as well as share her documentation methods, files and extensive textile research library. Quilt Restoration expert and AQSG member Anne Dawson has her own restoration business here on Lopez Island, which garners business from all over the country. Come learn the Do’s and Don’ts of caring for your quilts as well as suggestions for basic repairs. Bring one “needy” quilt and your questions. Show & Tell is a long tradition in the quilting community. Here is your chance once again to share a family quilt or a quilt from you own collection along with its story. Update: the quilt is finished! Stop by the museum to see this beautiful quilt, which features nearly 600 signatures. Three Lopez Island quilters, Laurie Latta, Anne Dawson and Karen Alexander, decided this spring it was time to create a very special Lopez Island Signature Quilt. They presented the idea to the Lopez Historical Society, and with the LIHS board’s enthusiastic approval, the project was launched at the Big Event in July. This project seeks to collect signatures and the “Lopez Story” of everyone who thinks of Lopez as “home.” Whether you are a fulltime, part time or summer resident, or have family ties to the island, the Historical Society wants to know your “Lopez Story.” How did you discover Lopez? What makes the Island meaningful to you? Why do you call Lopez home? The trio is now in the process of collecting stories and signatures throughout the entire Lopez Island community and they want yours! The Lopez Island 2010 Signature Quilt and all stories turned in will become a permanent part of the Lopez Island Historical Society’s archives to give future generations a peek at who was here at the beginning of the 21st century and what brought each of us to Lopez Island. You can download the signature form below, or stop by the Museum and pick one up. Contact Anne Dawson at The Quilters Studio (360-468-4677) if you have specific questions. You may arrange with Karen Alexander if you would like a brief talk given to your group about the project. Karen Alexander is still collecting family stories to add to the museum’s archives. Please contact her at the museum. She is also available if you would like a brief talk given to your group about the project.